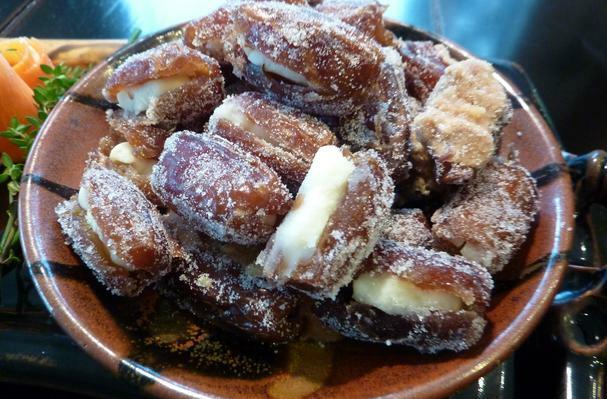 A date is a sweet, edible fruit that comes from the date palm tree. Dates, a staple food of the Middle East for thousands of years, are oval-cylindrical, 3–7 cm long, and 2–3 cm diameter, and when unripe, range from bright red to bright yellow in color, depending on variety. They are often served pitted with stuffings such as cheese, tahini, nuts, or wrapped in bacon (a Western appetizer). Dates do have a high health level, though with a lot of sugar. The sugar content of ripe dates is about 80%%; the remainder consists of protein, fiber, and trace elements including boron, cobalt, copper, fluorine, magnesium, manganese, selenium, and zinc. The date is an erect palm to 100 or 120 ft (30.5-36.5 m), the trunk clothed from the ground up with upward-pointing, overlapping, persistent, woody leaf bases. As the fruits develop, the stalk holding the cluster may elongate 6 ft (1.8 m) while it bends over because of the weight. The fruit is oblong, long, dark-brown, reddish, or yellowish-brown when ripe with thin or thickish skin, thick, sweet flesh and a single, cylindrical, slender, very hard stone grooved down one side. Colors: Dried dates are dark brown while fresh dates range from yellow to orange. Flavors: Sweet with caramel and honey tones. Food complements: Walnuts, Cinnamon, Brown sugar. Choosing: When selecting dates, look for plump, evenly colored specimens. All dates have a single long seed, but they can range in shape from oblong to round, depending on the cultivar. The date should not look dry or withered, and no crystals should appear on the exterior of the date. Buying: Dried dates are usually readily available in most markets, and fresh dates can be found in specialty markets in season. Procuring: Some high-quality dates are picked individually by hand, but most are harvested by cutting off the entire cluster. In North Africa, the harvesters climb the palms, use forked sticks or ropes to lower the fruit clusters, or they may pass the clusters carefully down from hand to hand. Growers in California and Saudi Arabia use various mechanized means to expedite harvesting—saddles, extension ladders, or mobile steel towers with catwalks for pickers. Dry or soft dates are eaten out-of-hand, or may be seeded and stuffed, or chopped and used in a great variety of ways: on cereal, in pudding, bread, cakes, cookies, ice cream, or candy bars. The pitting may be done in factories either by crushing and sieving the fruits or, with more sophistication, by piercing the seed out, leaving the fruit whole. Fresh dates will last for up to two weeks under refrigeration, while preserved dates can last much longer, depending on how they are preserved. In India, date seeds are roasted, ground, and used to adulterate coffee. The finely ground seeds are mixed with flour to make bread in times of scarcity. History: A date fruit is the product of a date palm, a tree native to Northern Africa and the Middle East, although it is also cultivated in other parts of the world. In addition to being eaten fresh, the date fruit is dried and eaten whole as a snack or included in an assortment of desserts. Many regional Middle Eastern cuisines incorporate dates, as do Mediterranean cuisines like those of Italy and Greece.